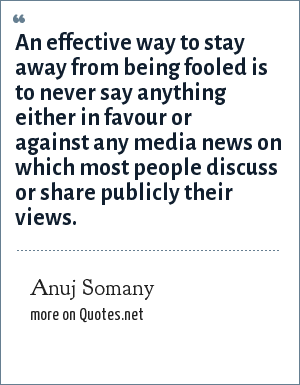 Anuj Somany: An effective way to stay away from being fooled is to never say anything either in favour or against any media news on which most people discuss or share publicly their views. An effective way to stay away from being fooled is to never say anything either in favour or against any media news on which most people discuss or share publicly their views. "Anuj Somany Quotes." Quotes.net. STANDS4 LLC, 2019. Web. 24 Apr. 2019. <https://www.quotes.net/quote/73965>.